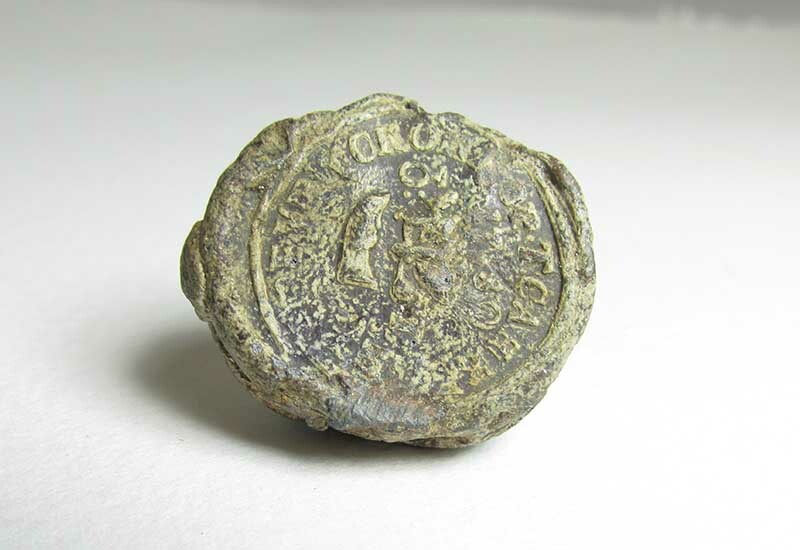 Cast lead Russian Cloth Seals, like this one, were used to identify the source and quality of batches of flax and hemp-based materials imported to the United Kingdom for use in the textile, sail and rope-making industries. For this seal, the distinctive markings identify the source as St. Petersburg and the date as 1789. The site where the seal was discovered is significant as it is close to Harvey & Company’s former Ropery. This could suggest that it sealed a sack or bale of hemp fibre for rope manufacture. Its presence in an arable field is not considered abnormal since any waste residue from the rope-making process was thought to have fertilising properties and a small seal could easily have been transported to the surrounding farmland within this residue. Similar seals have been found in other parts of the country, notably in Lancashire and East Anglia, major textile and agricultural areas respectively. They are, however, relatively rare in Cornwall.